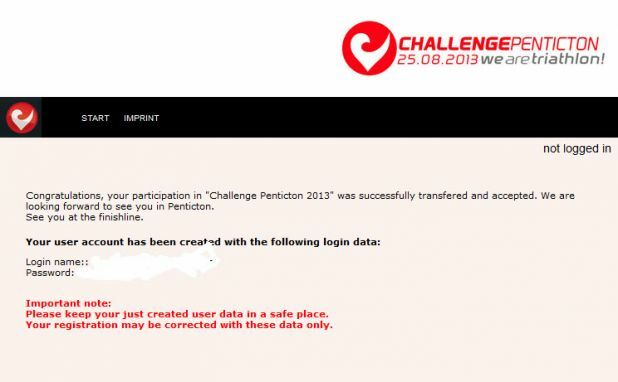 I am now registered for my second 140.6 triathlon! There has been a lot of chatter in the triathlon community over the last week with the news that Ironman would not be doing the race in Penticton, BC in 2013. Instead it has become a Challenge race. The biggest difference so far is that there will be more people on the course (3500 competitors) and there will be wave starts to stretch everyone out. Honestly I didn’t really care who ran the race. Especially since aspirations of Kona are not in my head right now; it really doesn’t matter that it isn’t Ironman branded to me. I just want another crack at the distance and after my trip to the course this summer I am super excited for this race. The race is 8/25/2013, just over four months after the Boston Marathon. I think I will be able to train hard for both races and hopefully PR in both (I am sure I will in Canada after my time in St. George). So watch for updates as I prepare for my next 140.6. I want to do the distance justice this time and leave it all out there! Looking forward to reading/hearing about your training. I am looking to go into the higher distances in 2013 – more towards 70.3. Kansas is closer to home for me and may be my first. Looking forward to increasing my training and base especially for the swim portion. Joining a gym with a pool this week to get moving. Good luck with your racing. I find using a plan I can stick to makes all the difference in the world. I am sure I will document the Canada training like I did for St. George. How awesome is this? Seriously excited for you to tackle the distance again. You will be great out there for sure. I am signed up for 70.3 Puerto Rico and Ironman Texas again for next year. I think I am traveling to Michigan for a 70.3 up there and then one of the following: Ironman Florida, Ironman Arizona or Ironman Cozumel. Those are all in November so we have plenty of time to get on each other’s nerves with our workouts…..haha! Good lord you have a crazy race schedule!!! Same as this year. The only change is that instead of racing in Maine next year it will be in Michigan. The other three are the same. Amazing! That is all there is to it! Can’t wait to cheer for you in Arizona!